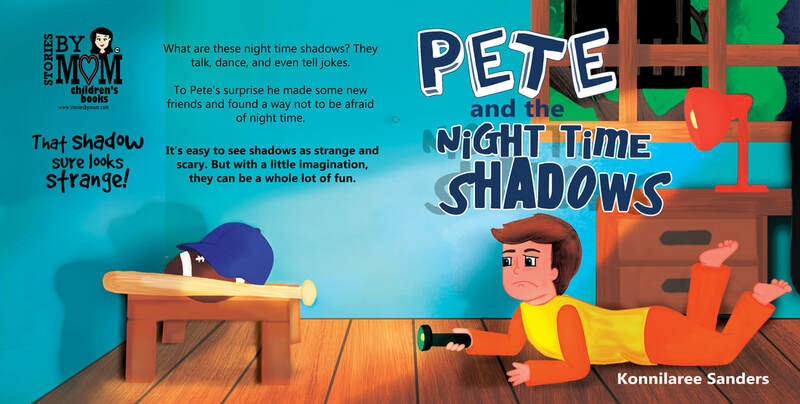 This book helps children with fear of the dark and learning to be positive. Pete was afraid of the dark. He was especially afraid of the shadows on the wall. They could be anything! But, worse than anything, they could be something. Pete's was too afraid to peek. But, then the shadows popped to life. It spoke, jumped off the wall and was ready to dance, play and even tell jokes. Pete realized he never had to be afraid again. This story has two origins. Many years ago I met my future mother-in-law, my bonus-mom and best friend. She used to make puppets to entertain my husband's little brother. She named them Phillip and Penelope. It was wild and silly. She had a beautiful heart made for telling stories. She too loved to write. Sadly, she passed away a few years ago after a long-term illness so I do not have any stories from her. So I took this memory and combined it with my daughter's late night shadow games and a child's fear of the dark. This is my first boy character and non-rhyming book. I wrote it in rhyme originally, but I wanted to explore new ideas and artistic style. Coming Soon - We will share coloring pages and some late night fun ideas. Below is the current front and back cover. Be sure to check back soon for changes, updates, and more sneak peek fun.